SCHUYLER COUNTY—During a monthly Watkins Glen Area Chamber of Commerce meeting, Schuyler County Volunteer Ambulance Association (SCVAA) President Jeremy Pierce talked about the associations’ plans and visions for the future. The SCVAA’s current building is now over 35 years old and needs many repairs. The association has also outgrown the building, with its increase in staff and crew and the number of ambulances they need to house. An addition to the building was added which gives them more room to conduct meetings and required trainings for EMT’s, but does not efficiently meet their needs for bunking rooms, equipment storage, secure computer facilities, or office space. 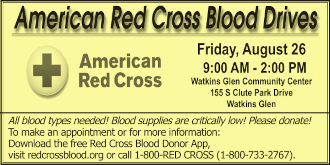 Schuyler Ambulance is located at 909 S. Franklin St. in Watkins Glen across the street from the Shared Services buildings. The association has a diagram of their vision of a facility that would give them the required space for current needs with ample space for expansion as the next 30 plus years go by. However, the SCVAA lacks the funds to build the structure. They announced that they have been seeking ways to fund the building and will continue to consider ideas and sources. The Chamber of Commerce meeting gave members a behind the scenes facility tour, ambulance excursions, equipment overviews and demonstrations, as well as an in-depth look into one of Schuyler County’s most crucial organizations. The meeting was attended by over forty Chamber of Commerce members. Also present were SCVAA members, county officials, and Emergency Medical Technicians (EMTs). 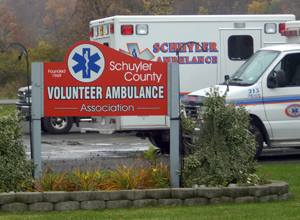 SCVAA Is a not-for-profit 501(c)4 organization formed in 1969 to provide first response emergency medical service to Schuyler County. The association employs between 25 and 45 people (depending on the season) and has a volunteer membership of over 20 people most of the year. Its operating budget is over $800,000 a year and owns five ambulances fully equipped for Advanced Life Support. SCVAA receives no financial support from the federal, state, county, village, or town governments. They are supported by service contracts, insurance payments, and donations only. For more information about SCVAA, or if you would like to become a volunteer, check out the Web site: http://www.schuylerambulance.org, or call 535-7273.